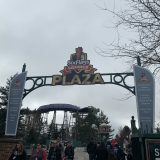 On Saturday, March 17th, 2018, which also was St Patrick’s day was spent at Lake Compounce for American Coaster Enthusiasts annual Off Season event called The Great Nor’Easter! 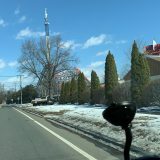 For those that are not familiar with this event, It’s a great event that gets Members of the Coaster Group together, especially after the harsh winter we have been having. We play some games, have park presentations, Door Prizes, a Great Lunch and also get to hang out with our coaster friends! The opening multiple choice game, which ended up being fun, consisted of using a packet of letters, which were a,b,c,d and you would show the letter for whatever you thought the answer was. After a few a rounds it came down to Luko SImlesa being the winner and the only person standing. His prize? He was able to pick 5 items from the door prize pile to claim for victory! Next up was Six Flags New England giving their presentation and released a ton of information to all of us on the upcoming 2018 Season! Below you can watch the entire Presentation and see all the goodies for yourself! 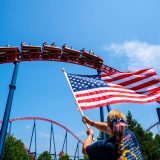 We also had Six Flags Great Escape give their Presentation for the upcoming 2018 Season and you can also watch this video below! With tons of door prizes being given out, it really felt like an Oprah Show! Afterward, it was time for Quassy to come up and talk about their upcoming 2018 Season and, you guessed it! The video is below to check that out! Canobie Lake Park was next on deck and they were talking about their Water Park Addition, So you can watch this video below and hear about all the things going on for Canobie Lake Park in 2018! More door prizes were awarded, as well as lunch! There were some awesome sandwiches and some brownies & cookies and were pretty good. 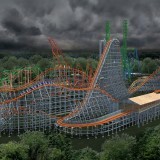 After this Lake Compounce came on up and gave their presentation which of course, you can watch below! We also took a group photo during all this madness, talked with old friends, made some new ones. The event isn’t done just yet. Newcomer Palace Playland from Maine ended the event and I will say they ended the event with a bang! 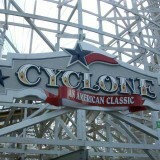 Giving park history, Talking about their two new coasters and much more! 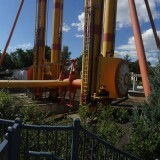 We also got a POV of the ride before it was painted, while it was still in Italy! So you can check that out and their entire presentation in the video below! I hope everybody enjoys the videos and the information that you all got to take in and enjoy! For those who have not Subscribed to SFNEOnline’s YouTube page that these videos come from, please click it and also if you do like a video, click that like button! 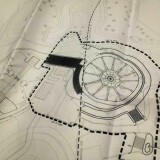 Leave a comment, let us know what you thought of a parks presentation, what are you excited about for a particular park! 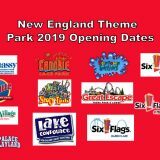 Next story Six Flags New England Opening Day 2018!